The Midwest has had one of the wettest summers I can recall. Our yard is in the overdrive normally seen in early June. Now in August, nothing has slowed down…..tomatoes, peppers, herbs and the lawn….oh -the lawn! At this point we normally mow maybe every 10 days or so….. This year we can’t even make it a week! Many of my shrubs and even my Magnolia have bloomed again. The local farmers and orchards are also turning out lots of local veg and fruit. The peaches grown locally are huge! Blueberries I have bought are the size of grapes. It will be interesting to see the apples. A different year indeed…..
Another difference this year is my youngest son got his first job. The kids here have had a harder time finding employment recently with so many of the adults taking jobs they normally get. What has normally been a long, somewhat boring summer has gone by very quickly for him. Another step into the bigger world. 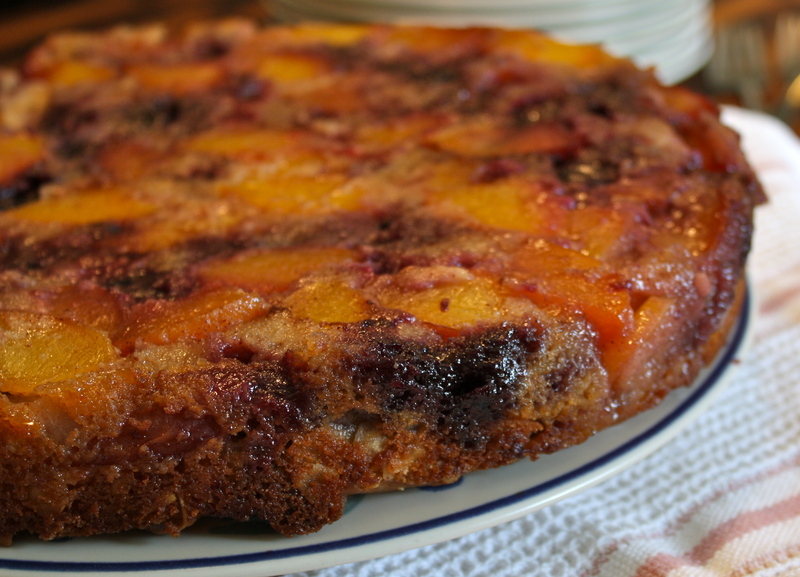 With his classes starting up this next week, I decided to make an upside-down cake with summer fruit. 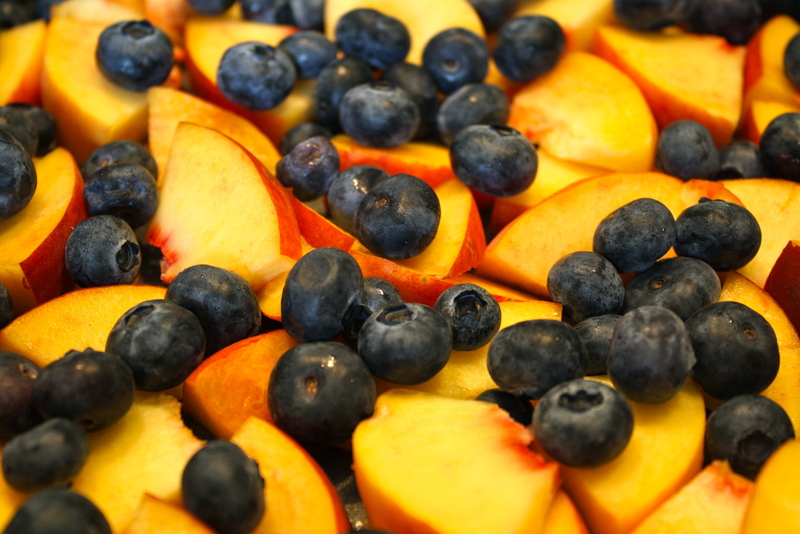 This time using what is plentiful: peaches and blueberries, making a mix of the cut fruit with butter, sugar, and plenty of cinnamon. 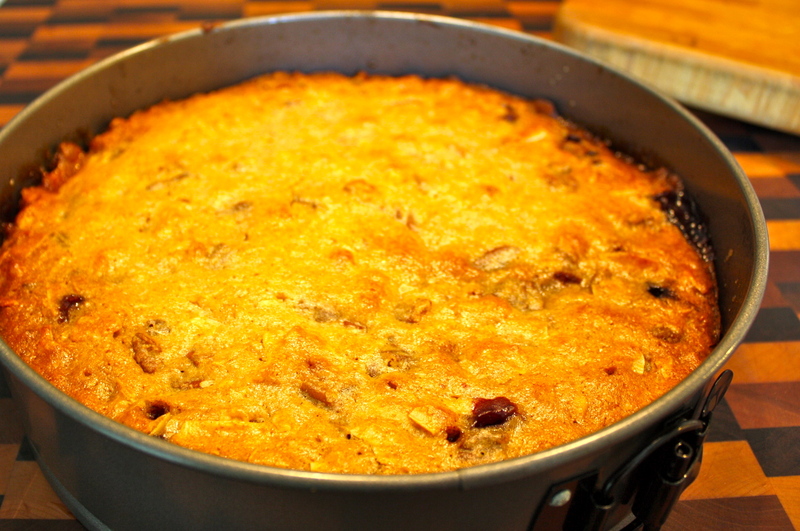 The cake would have flaked unsweetened coconut, pecans and vanilla yogurt. Bringing everything together takes about 15-20 minutes. 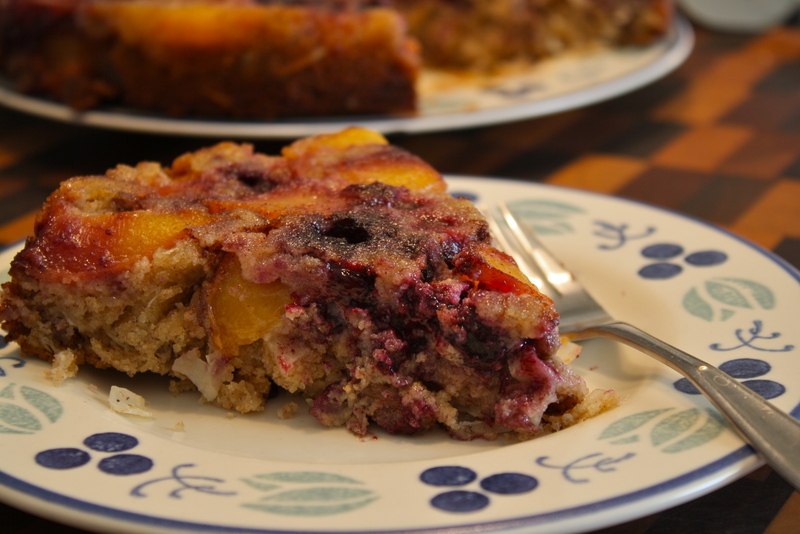 With the fruit on the bottom, this one bakes for just under an hour. Cool for about 10 minutes and then invert while its still warm. You need to flip it to allow the fruit to cool so it doesn’t make the cake mushy. Then let it cool for at least an hour. Nice flavors all around from the fruit, spices, coconut and pecans. Well liked by all, including our new hard working young man. We give it a 10! Melt butter and add 1 tsp cinnamon. Stir to combine. Toss fruit with sugar. Pour cinnamon butter over fruit. (cold fruit would make the butter solidify) Spread mixture over the bottom on spring-form pan. Set aside. In a medium bowl combine pecans, flour, coconut, baking soda, salt and cinnamon. Set aside. Using a stand mixer, combine eggs and sugar, mix until well incorporated (several minutes). Add oil and yogurt and mix again at medium speed for another minute or two. Reduce speed to low and gradually add the dry ingredient mix. Beat until just combined. Pour batter over fruit into pan. Use a spatula and spread batter to the edges. Bake for 55 minutes until golden and toothpick inserted removed clean. Cool for about 10 minutes and then invert onto serving dish (cake will get mushy from the hot fruit if you wait until its completely cool). Allow to cool completely once inverted. This cake needs no embellishment. (It’s that good!) Enjoy!